There is just a plethora different drink mix choices from many different companies. Most, however, only offer one or two flavour choices. On top of that? They’ve got insane sugar content and a bunch of other additives that are just bad for you. 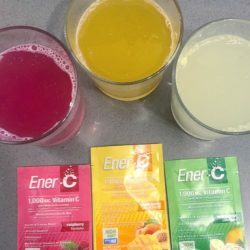 Ener-C has created a variety of drink mix flavours that appeal to the nutrition conscious consumer. With extreme amounts of Vitamin C, you won’t have to worry about packing an orange with you, if you’ve got one of their drink packets.